In my experience, when a business owner or self-employed individual decides to move to an online platform, one of the first items they choose to tackle is developing a social media account for their business. Facebook, Twitter, Instagram, YouTube, etc. While having a social media business account is certainly okay — and most likely a good idea — some people decide to stop there. There are a few reasons why this is okay and why they should keep developing an online presence. Why Might Social Media Be Okay as Your Only Source of Online Information? Why a business owner might choose to only keep a social media account as their “business website” may vary, but here are a few likely reasons. Social media is such a prominent part of most peoples’ lives, that it’s very likely they’re comfortable with using it. Because social media is so popular, many platforms also make it easy to set up accounts for businesses. If the platform charges for advertising, they want people to set up business pages as a way to make money. Aside from being easy, it’s also usually free to create a basic account for your business. That alone appeals to many new business owners who may be trying to save money. What more do you need besides free and easy? Being able to share the business page with friends and relatives. Getting the word out about your new business page is a nice benefit of using social media. After all, its intended purpose is to be social and engage with potential customers. 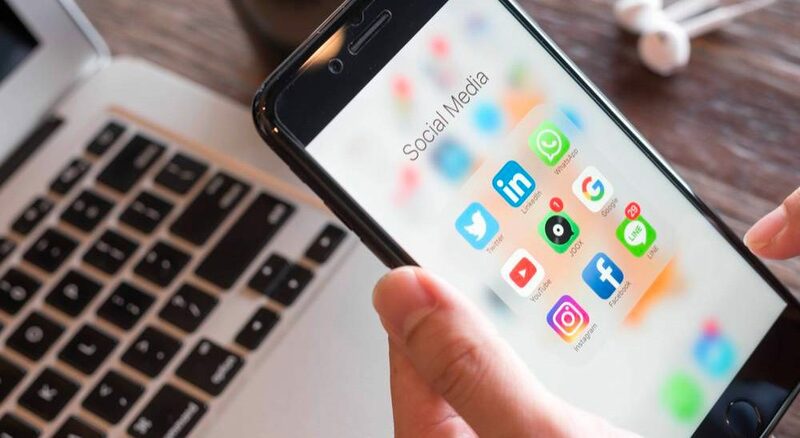 While the benefits may be obvious to using social media for your business — and it’s usually a good idea to have at lease one social media account for your business — there are also very important reasons why businesses shouldn’t stop there. Content sections within social media platforms are generally fixed. If you want to add specific information on a specific page, you’re limited by what the platform will allow you to do. While you can post images and use your company’s logo, there is much you can’t do in terms of color, fonts, layout, and overall design. Most social media platforms have some form of advertising option where you can promote your services and offers. That’s certainly great, however, if you have a website, you can add these sections freely. If the budget allows for it, businesses can also advertise their site through search engines as well. Social media accounts do show up in search engine results over time — like Google or Bing — however, they’re mostly self-contained. Meaning you may have services or information you want to share on the web, but are limited within the overarching “container” of your social media profile. The account may show up in search results, but specific information may be hidden. This is especially true if the company decides to blog, versus writing posts or tweets. This is probably the most impactful reason business owners should seek to have a separate, standalone website of their own: You don’t own the social media platform (unless you’re Mark Zuckerberg). It’s extremely important to maintain an independent level of control over your own company’s online presence. Relying on a third-party, however stable, is putting your most valuable online presence in the hands of someone that does not have your very best interests in mind. Social media platforms can change anything however they want, whenever they want, and you’re subject to those changes without any input. Those changes can impact how you do business — for better or worse. In most cases, companies will have a standalone website as well as one or more social media accounts for their business. Currently, that’s the standard for any business to begin developing their online presence — and that’s a good thing. However, there are a few key points to keep in mind if you find yourself balancing both a website and social media. It’s very important to keep your business information consistent across all platforms. It can be tedious, but you don’t want to confuse potential customers by providing incorrect or outdated information. This may seem obvious, but I have found it to be a pretty common issue. The most important information would be business hours, contact information, and location. Other information can include types of services, special offers, and important notifications, such as construction, random closures due to weather or lack of power, etc. Having a website and one social media account may be easy to manage, but as a business starts to add more accounts, it’s important to keep track of them. Whether it’s you or a designated “web/social media manager,” having someone maintain a list of accounts and privately maintained logins is good for knowing what needs updated. While this is part of overall consistency, it’s not immediately as critical as your company information, but close! If a company decides to update its logo, brand, or imagery, it’s a good idea to sweep across all online accounts to ensure online visitors know immediately that it’s the same business. Priority-wise, this should fall directly after updating any changes in business information. If you have questions or concerns about your online presence, social media account management and consistency, or you’re just getting started, please contact me. I’d be happy to help or provide guidance! DIY Website Builders: Pros & Cons… Are They Right for You? Receive my standard logo package at a discount rate! DezfoxTM is a design website that I use to showcase some of my work as well as a resource to help business owners and other designers. Feel free to shoot me an email if you'd like to chat!